Contact us at the email address and we can give you good advice regarding airlines, car rentals and everything else you will need to get here to our beautiful island paradise ! Access to Karpathos Island is easy ! Most major airlines from the United States and Canada, Europe, and many other locations will fly you to Athens. From there, Aegean Airlines or Olymic Airlines can get you via Rhodes to Karpathos and there are some direct flights to Karpathos from Athens via Olympic Airlines. Below are some links that will provide additional information about our lovely island. Click Here for Great Things to See and Do in our Island Paradise ! 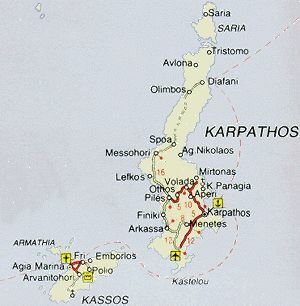 Click Here for Up to Date Weather Reports for Karpathos ! Click Here for Athens International Airport ! Click Here for Athens International Airport in the Greek Language ! For some interesting music - even though it isn't Greek - click here ! 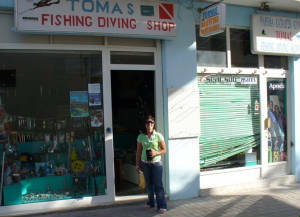 For all your fishing and diving needs, this is the place to go in Karpathos/Pigadia. 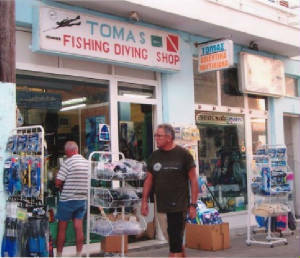 Everything you will need for fishing and diving adventures!